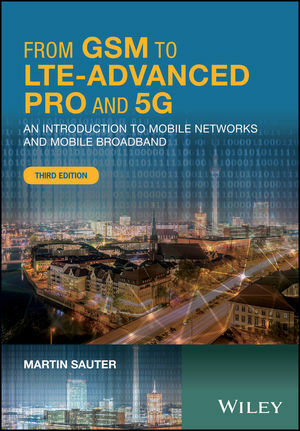 From GSM to LTE-Advanced Pro and 5G: An Introduction to Mobile Networks and Mobile Broadband, 3rd Edition provides technical descriptions of the various wireless technologies currently in use. It explains the rationales behind their differing mechanisms and implementations while exploring the advantages and limitations of each technology. This edition has been fully updated and substantially expanded to reflect the significant evolution in mobile network technology occurring over the past several years. The chapter on LTE has been extensively enhanced with new coverage of current implementations of LTE carrier aggregation, mobility management, cell reselection and handover procedures, as well as the latest developments in 5G radio and core networks in 3GPP. It now features additional information on the TD-LTE air interface, IPv6 in mobile networks, Network Function Virtualization (NFV) and Narrowband Internet of Things (NB-IOT). Voice-over-LTE (VoLTE) is now treated extensively in a separate chapter featuring coverage of the VoLTE call establishment process, dedicated bearer setup, header compression, speech codec and bandwidth negotiation, supplementary service configuration and VoLTE emergency calls. In addition, extensive coverage of Voice-over-Wifi and mission critical communication for public safety organizations over LTE has been added. The WLAN chapter now provides coverage of WPA2-Professional with certificates for authentication in large deployments, such as the global Eduroam network and the new WLAN 60 GHz air interface. Bluetooth evolution has been addressed by including a detailed description of Bluetooth Low Energy (BLE) in the chapter devoted to Bluetooth. Questions at the end of each chapter and answers on the accompanying website make this book ideal for self-study or as course material. Martin Sauter works in the telecommunication industry as a thought leader, researcher, book author and blogger and is based in Cologne. His interests are focused on mobile communication networks, multimedia applications and especially the wireless Internet.